Not sure there could be a more appropriate name for this fudge. 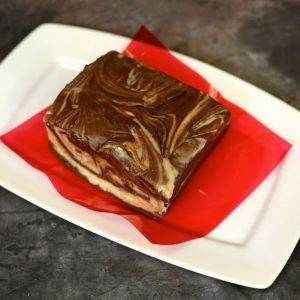 It’s fudgey, it’s delicious, and it’s great ANY time of month, but never more than when we are tempted to sell off one of our offspring for a bit of chocolate! This rich dessert is both decadent and a bit addictive so consider yourself warned! It’s best to keep it frozen since it will melt if left out at room temperature. I often serve it at party’s in a dish on top of a bowl of ice to keep it hard enough to still eat with your hands. This recipe has been adapted by many other amazing recipes out there. Hope you enjoy! NOTE: This is a two-layer fudge with two easy steps. First you’ll create the bottom layer, chill it a little, then add the top layer. Line a small, shallow, and preferably glass dish (I used an 8 x 4 rectangle Pyrex baking dish) with parchment paper. Combine all the above ingredients for the bottom layer in a small bowl. Pour into the dish, and place in freezer for about 20 minutes. Next, combine all the ingredients for the top layer in a small bowl. Pour over the frozen bottom layer and return to dish to freezer for another 20 minutes. Keep in refrigerator or freezer. Don’t let it set out long; it will quickly become gooey at room temperature! Want a FREE monthly Meal Plan plus support from me and other women just like you? Join HERE!